(LOS ANGELES, Calif.) September 5, 2014 – Duck Dynasty star Willie Robertson announces his involvement with this apocalyptic action-thriller feature film based on the New York Times best-selling book series starring Academy Award winning actor Nicolas Cage. 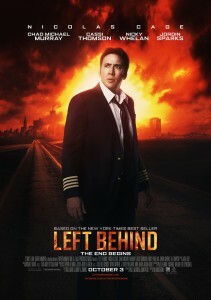 Left Behind follows Rayford Steele (Nicolas Cage) who is piloting a commercial airliner during the Rapture when millions of people around the globe simply vanish. Thirty thousand feet over the Atlantic, Rayford is faced with a damaged plane, terrified passengers, and a desperate desire to get back to his family. On the ground, his daughter, Chloe Steele (Cassi Thomson) is among those left behind, forced to navigate a world of madness as she searches for her lost mother and brother. LEFT BEHIND opens nationwide on Friday, October 3, 2014. For group tickets, please go to www.LeftBehindMovie.com.